The pawpaw is the largest edible fruit native to the United States. It grows all over the central and eastern United States, but pawpaw fruit isn’t easy to come by. First of all, they need to be dead ripe to be delicious. That means soft, squishy, and not well suited to shipping long distances. You may find them at farmers’ markets or pawpaw festivals (yes, there are pawpaw festivals), but don’t count on it. People don’t like to part with their hard-won pawpaws. In the wild you’ll often find pawpaw trees but no fruit. That’s because humans aren’t the only animals who love pawpaws. Also, pawpaw flowers can’t self-pollinate, which cuts down on naturally occurring fruit. By the time the male part (the anther) of the pawpaw flower produces ripe pollen, the female part (the stigma) is no longer receptive. 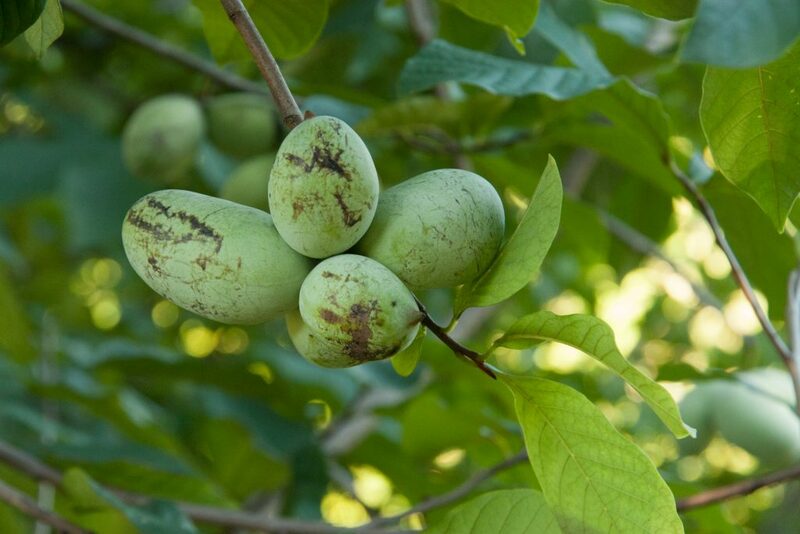 To make matters even more complicated, pawpaws tend to grow in clumps of clonal populations connected by underground roots. The flowers of trees of the same clonal population are incompatible for sexual reproduction, which means cross-pollination between unrelated trees is required. Since many pawpaw groves are composed entirely of trees from a single clonal population, you can see how this might be a problem. Commercial pawpaw growers have resorted to hand pollination and the results are excellent. As a tree, the pawpaw is lovely to look at. Its leaves are large and elliptical (up to 10-12 inches long) and dark green. Its flowers are dark maroon and bell-shaped; they form on the trees before the foliage has fully emerged. In nature, pawpaws are understory trees, growing in light shade. Their fall foliage is a bright, beautiful yellow. This tree would be worth growing for its beauty alone. Pawpaw fruit may fall from the tree while it’s still green, but if it’s far enough along it may still ripen, so gather up any green fruit you find and bring it home. Put it in a paper bag with a ripe apple and watch for the fruit’s skin to turn yellow-brown and the texture to soften to a ripe banana-like consistency. The flesh of pawpaw fruit is yellow or white. Inside are two lines of large, black seeds. Cultivated pawpaw trees often produce clusters of four to nine, 4-5 inch long fruit. If someone serves you an orange fruit and tells you it’s a pawpaw, they’re mistaken. Some people call papayas pawpaws, and it doesn’t help that the internet is full of papaya images labelled pawpaw. Consider yourself warned! The flavor of pawpaw fruit is sometimes compared to that of banana, but it’s not even close. Pawpaw fruit is so rich that some people find it overpowering. I am not one of those people. I worship at the altar of the pawpaw. The pulp is delicious enough to scoop out of the skin and eat raw, but don’t eat the seeds. Pawpaw also makes a superb ice cream, an unusual cocktail ingredient, and a rich, indulgent crème brûlée.